After close to a month of negotiations, United Arab List, Balad, Hadash and Tibi's party decide on unity, with polls giving them 11 seats. 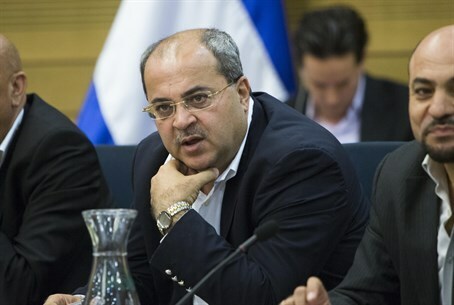 The Arab parties of Balad, Hadash and United Arab List, which split earlier on Thursday when MK Ahmed Tibi broke off to form his own one-man party, decided on Thursday night to unite their parties on a joint list. The decision could see their joint list come in as the fourth largest party in the coming March 17 elections, as the most recent poll on Thursday forecast that together they can expect 11 mandates. Negotiations have been held for around a month on unity between the parties, with major differences in interests between the parties that represent different regions, populations, ethnic groups, and ideologies, thought to keep the division between them. Balad largely represents Arab citizens in the Galilee, while United Arab List represents Bedouins in the Negev. Hadash for its part is a Communist party, with a steep ideological divide from the rest. The outgoing coalition significantly raised the threshold percentage needed to enter the Knesset, forcing the Arab parties to discuss unity so as to avoid being kept out of the Knesset given that nearly all have been predicted by polls to either just squeak by or else not make it over the threshold.